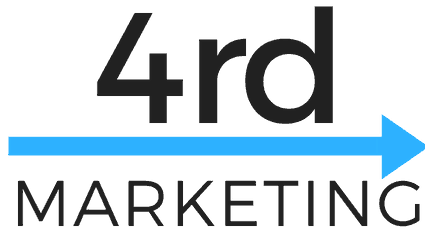 ﻿ One of the most requested podcast topics is Facebook marketing (Our Facebook A to Z is one of our most popular podcasts). Today we cover 7 easy ways to utilize growth hacking tactics for success on Facebook. Today’s episode is highly actionable, with a recipe for how to boost ads, how to target new customers and more. You must know your audience, what they like and dislike. One way to discover this is to do “themes of the month.” You could try to focus on one aspect of what your business values and see where that overlaps with your audience. Knowing your audience is the key to success with facebook ads and social media. This simply means uploading content directly to Facebook. Don’t always link out to your website or to your youtube channel, post the actual video on your page. Facebook (as well as other social media channels push this). It’s pretty straight forward, you simply click the upload buttons on your post vs copying and pasting a link. You should make it a habit of following those other businesses that are in your space. Try to follow hugely successful competitors. While this isn’t’ great for traditional market research (by itself) it’s profound on social media. In particular, you want to follow competitors on facebook that are running successful pages and ad campaigns. If their ads and posts are getting engagement then there are likely clues to what would make your facebook ad campaign successful as well. If you see something that is getting traction, do it yourself. Either re-create the idea or straight up “borrow” it. Facebook now allows you to see everyone’s ads. If you did step 3 and are following successful competitors then you can simple “be inspired” by their ads. The ad has 3 keys. Question plus value propisition plus call to action. 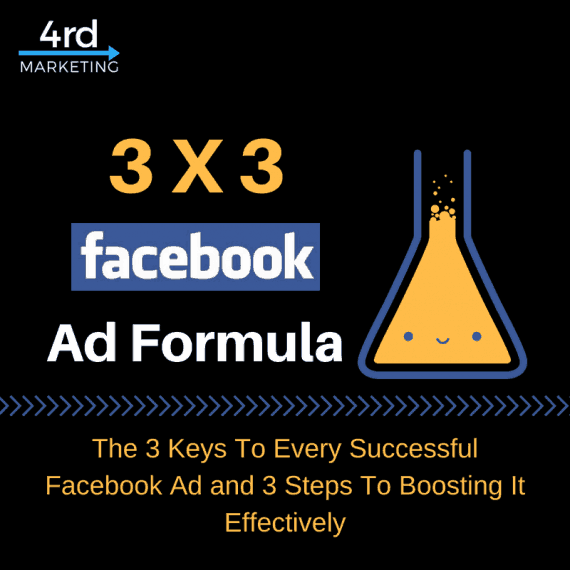 It’s as simply as “do you have this problem?” + “I have the solution” + “buy my solution.” Obviously, you’ll need more than that but those are the 3 key components of a successful facebook ad. When you boost, boost first to your fans, then to their friends and lastly to the public. You do this in this manner to gather engagement. IF you fans engage with this content, then there is a good chance their friends will. If their friends engage then your audience will. Most business owners make the mistake of boosting it in reverse. They boos the ad and see that it has more impressions but wonder why they only get a few more likes than the original. When you boost your ads in this manner, starting with your fans first, you get a snowball effect of engagement. This boosting 1,2,3 process is also a daily process. When you boost to your fans first, you do that on day 1, then day 2 it’d be boosted to their friends and the on day 3 it’s your “outer” audience or everyone else. If you want to grow your audience target pages. Find your biggest competitor and target their fans. (Sound familiar) Generally you want to target your most engaging competitors. If you have a competitor but they aren’t doing anything on facebook then you want to follow them, but stick to “emulating” brands that create huge engagement (comments, likes and shares). Basically if you did the above you already have done this and read this. What I’m suggesting is literally targeting fans of that page. When I went to write the show notes I thought I’d give you guys a great example. I thought about what is “hot” right now if you were marketing “guru” sales and encouragement “stuff.” Grant Cardone’s name came up. This guy is everywhere it would seem. So I went to facebook to start jotting down metrics for how he does it for a great example. How underwhelming! His page doesn’t have very engaged users relative to his fan base. For Example, he has over 6 Million Followers but rarely more than 10 comments or shares! So that would not be the fan base I’d target. 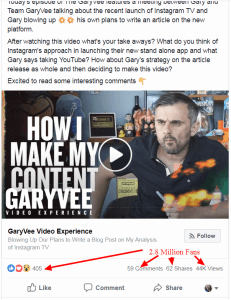 True to form, Gary Vaynerchuk’s 2.8 million followers are highly engage relative to Grant’s. On facebook at least there is no question who is more engaging. Good metrics are 200K fans or so and 30+ likes per post. As those fans scale, so should the likes per post.